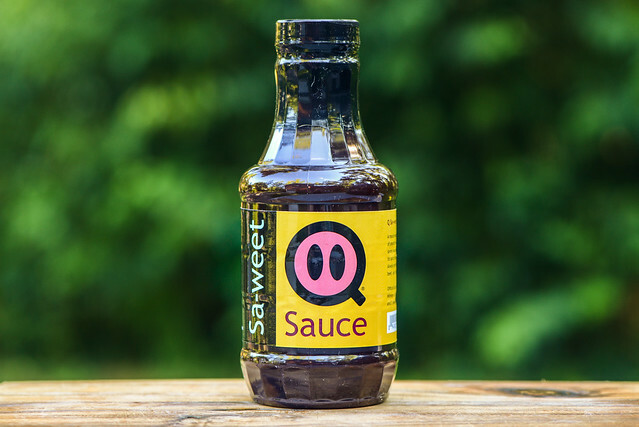 An extremely well balanced play between sweet, fruity, tart, and spicy that exists out of the jar and after being grilled puts Q Sauce Sa-weet in the top ranks of best all-purpose barbecue sauces. There are few people I'm more familiar with in the world of barbecue than Tuffy Stone. Known as "The Professor," Tuffy has made a big name for himself in the world of smoked meats through numerous awards and championships with his competition team, Cool Smoke. This success led to him being featured as judge and contestant on the BBQ Pitmasters series, making him a household name among those that follow the barbecue world. I've been lucky enough to taste some of his excellent competition 'cue, but it wasn't until last spring that I finally had a chance to visit one of his three restaurants in the Richmond area, Q Barbeque. The food and service left me impressed, and on my way out, I grabbed two bottles of their Q Sauce to give a try out at home. 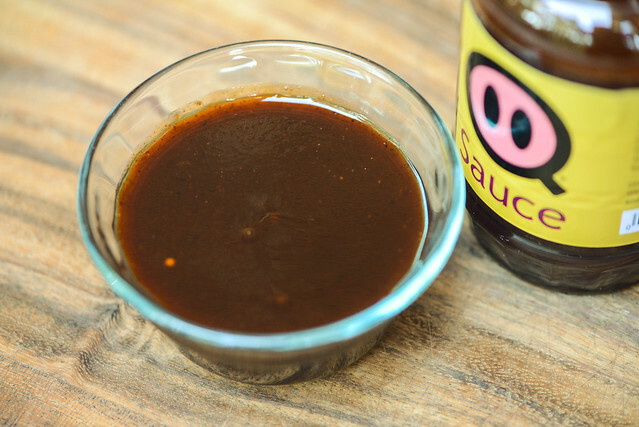 A smoky, sweet molasses aroma fills the nose on the initial smell of this sauce. The sugary base also has a bright, fruity ketchup component that adds complexity to the sweetness. Upon a few deeper whiffs, a helping of Worcestershire makes itself easily known along with a mild tartness. There's also a garlicky, lightly earthy spice hiding in the background. 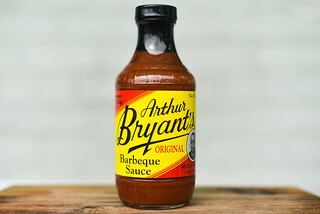 Altogether, this adds up to a fairly standard barbecue aroma, hitting the common sweet, fruity, and tangy notes. This dark maroon sauce is opaque with a glossy sheen. This opacity makes it difficult to make out many spice specs, save for a few larger bits or black pepper here and there. 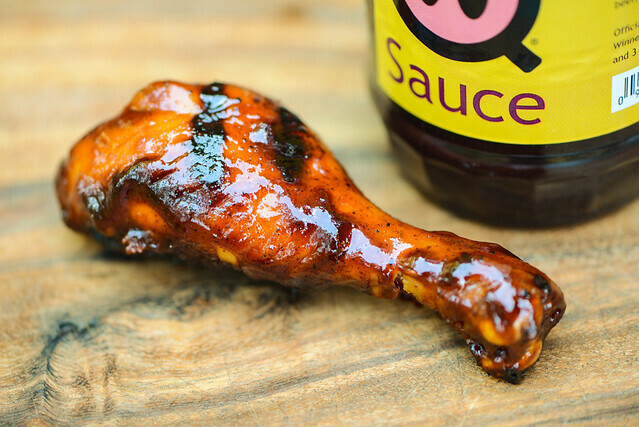 The thickness hits right in the middle of the scale, and the sauce has a syrupy consistancy that has it flowing in a quick, steady stream from a suspended spoon. After a few final drips slowly release, a semi-transparent, medium coating of sauce is left clinging, in which you can clearly see a plethora of spices that were difficult to discern otherwise. While the aroma may have been fairly standard, the flavor stands out in its uniqueness. 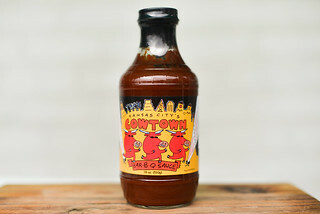 It begins with super sweet, fruity ketchup flavor that gains complexity quickly by way of molasses and Worcestershire. That flavor persists and remains mellow enough for the spices to add their own touch next with garlic, onion, and an earthy, not-spicy chili. As the spices mingle with the sugar, vinegar starts to lend a mellow tang that builds to a medium tartness. Then the heat from the peppers hits and adds just enough spiciness to contrast the sugars, creating an incredibly well balanced mix of sweet, tangy, fruity, and spicy in the end. On the grill, this sauce coated the chicken leg in a medium, even layer that baked down well over indirect heat. It then caramelized nicely over direct heat with no burn off. The chicken came off the grill with a picture perfect shiny mahogany color. The taste matched the looks with its flavor that was pretty identical with what came out of the jar. It retained its sweet, fruity profile with enough complexity to give the meat excellent flavor without being challenging. The best parts were the caramelized bits, which held intensified concentrations of these flavors that outdid the sauce in its raw state. I'm a spicy sauce guy, so I'm always a little dubious whenever I crack open a bottle of the sweet stuff. I knew Q Sauce Sa-weet grabbed my attention at the restaurant, but perceptions while eating out can differ a lot when at home. Luckily memory was matched by stellar results with this sweet sauce when I gave it a test. It had a balance and complexity few sauces achieve, one that travels through one great flavor to the next without tasting overly bold or pulled too much in one direction or the other. The fact the it had these traits out of the jar and after being cooked is worth noting as well, since the tendency is for sweetness to overtake all after being cooked, but that was not the case here. 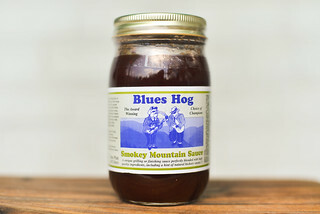 I can imagine this sauce going great on almost anything I throw on the grill or smoker—whether it be used as a slather while cooking or dip when serving. I'll gladly take that other jar off your hands. You did say you got two, right? Ha!